A Chemical Peel is ideal for treating and improving the effects of aging, photo-damaged skin, fine lines and wrinkles, pigmentation abnormalities, superficial scarring, acne, and melasma. This is a minimally invasive step to achieve healthy looking skin. For some, a more advanced method would be Intense Pulsed Light (IPL)therapy or Fractional Skin Resurfacing Laser. The Chevy Chase Cosmetic Center offers all three options, and your practitioner will advise you on the best method to improve your skin tone and texture. Come in for a consultation to see which treatment is best for you. Call 240-482-2555 in Chevy Chase, Maryland, and 301-345-7375 for an appointment in Greenbelt, Maryland today! Irina and Gwen, our licensed medical aestheticians offer SkinCeuticals chemical peels, microdermabrasion, and medical grade facials. Our office-based chemical peels are essential for maintaining your skin's healthy appearance. 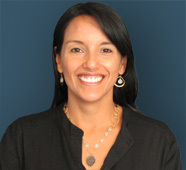 You can make an appointment with Irina in our Chevy Chase office and Gwen at our Greenbelt office to schedule your SkinCeuticals chemical peel. What can be expected after a chemical peel? 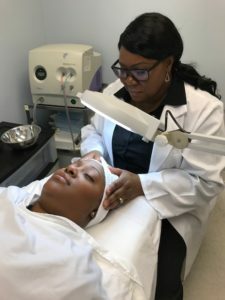 Is it safe to have a chemical peel on a regular basis? How long should a chemical peel remain on the skin before washing? Can a chemical peel be performed on the neck and décolletage chest area? Chemical Peels can be used on the neck and chest to improve fine wrinkling and blotchy discoloration including brown age spots. One peel is usually not sufficient enough to give the best results. Therefore, non-facial peels are usually repeated several times to achieve best results. It is important to understand that non-facial areas generally do not heal as well as the face due to significantly less amount of hair follicles and sebaceous glands. You might see less peeling on non-facial areas than on the face, but it will still notice an improvement in texture, smoothness, and color of sun-damaged skin. What makes a chemical peel helpful in the management of acne? One of the active ingredients in Vitalize Peel is salicylic acid that has been used for several decades to treat acne. Salicylic acid is a comedolytic agent. This agent is lipid soluble and therefore, it penetrates through the sebum of acne-prone skin better than water-soluble acids. Also, salicylic acid has anti-inflammatory properties since it is related to aspirin. In addition, Retinoic acid inhibits sebum production and reduces hyperkeratinization. It helps to unclog the pores and prevent the formation of new papules. Superficial exfoliation produced by Vitalize Peel also helps to improve post-inflammatory hyperpigmentation caused by acne lesions. 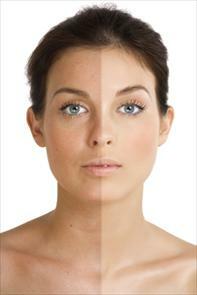 How long after receiving a Chemical Peel can one be exposed to the sun? Come in for a consultation to see which treatment is best for you. Call 240-482-2555 in Chevy Chase, Maryland, and 301-345-7375 for an appointment in Greenbelt, Maryland today!